A review of the show in the National Post. The word tusovka ... comes from the verb tusovat, which means ... to shuffle or mix the cards. Subsequently, the term tusovaniye (shuffling) has come to signify a factor contributing to artistic relations, while tusovka is an artistic and intellectual community or association. ... 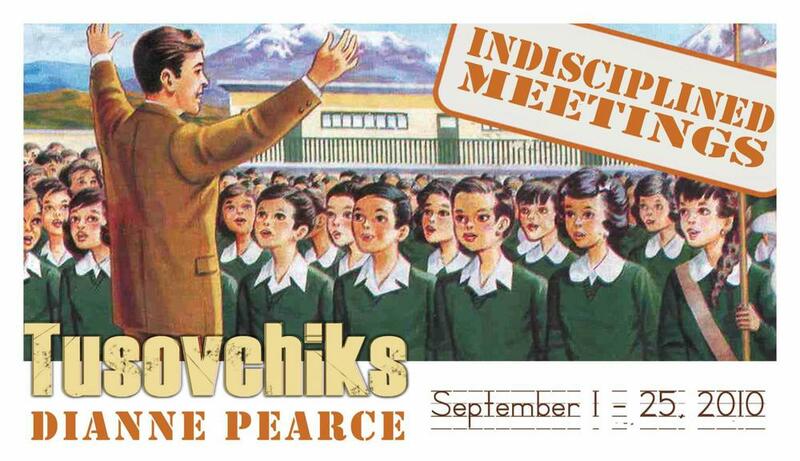 Meetings are the vital component of tusovka, i.e. it exists as a series of meetings. ... doing it does not require established qualities or virtues, or professional or social standing. ... To be in tusovka, you just need to be there. ... Tusovka is a syndrome whose origins lie in the collapse of a disciplinary culture and social hierarchies. In turn, the effectiveness of the participant [tusovchik] in such projects ... is achieved through individual flexibility and acceptance of the other. - Viktor Misiano, “An Analysis of ‘Tusovka’. Post-Soviet Art of the 1990s”, 2002. In my work, I have come to embrace carnivalesque environments and encourage ‘indiscipline’, which I translate into unruly encounters between the public and the work: not only do the environments I create tend to look like parties or school rooms, but the pieces often invite the public to touch or otherwise interact with them. As an art professor and museum educator, didactic-like materials riddle my work, encouraging a DIY philosophy of unschooling. As such, my work is no brow and participatory--it is for all ages. These interests have come about from having lived in Mexico City for 13 years, and now raising a bi-cultural family. My work has undoubtedly been informed by Mexican popular culture, and it manifests the aesthetic influence that country has had on my art. Use the materials provided in my two installations to make your own pieces. In Polyphonic Novel, use up to 516 rubber stamps of images from the Webster’s Dictionary to create your own visual stories. A variety of papers and coloured stamp pads invite maximum creativity, then pin them to the walls of the gallery and take a few home with you. In Indisciplined Meetings, sit in the workshop area and colour the same images, but now in colouring books and translated into Spanish. There is a selection of 10 colouring books to choose from, and crayons will be in abundance. Can’t colour all the images in your book in one afternoon? Take it home with you! The artist will be in attendance and refreshments will be served. Dianne Pearce acknowledges the Ontario Arts Council for supporting the creation of new work, as well as facilitating the exhibition and Culture Days.